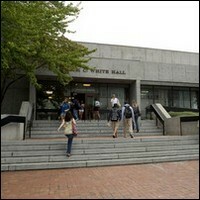 White Hall houses Room 208, the largest classroom on the Emory University campus with a capacity for 280 in stadium-style seating, as well as Room 205, which often hosts film screenings. Parking: Parking is available in the Oxford Road Deck just past the Barnes & Noble at Emory bookstore. From the Oxford Road Deck, walk through the plaza and up the stairs between the B. Jones Building and the Mathematics and Science Center. Cross Dowman Drive, and White Hall is on the left. Parking is free in the Oxford Road Deck after 7 p.m.